Place the chicken breast pieces into a bowl or freezer bag with the yogurt, garlic, ginger, lemon juice, coriander, turmeric, cumin, paprika, chilli powder, cinnamon, salt and pepper. Mix together so that everything is combined, then cover and place in the fridge to marinate for 2-3 hours. Remove from the fridge and thread the chicken pieces onto four long metal skewers (you can use wooden skewers if you prefer, but soak them in water for at least an hour beforehand to prevent them from burning). Brush the chicken skewers all over with the oil, then grill for 8-10 minutes, turning once or twice until fully cooked and a little charred on the outside. Make sure the chicken is cooked by slicing into a large piece and ensuring it's no longer pink in the middle. Place the chapatis onto four plates. Add the sliced lettuce and the cooked rice, then remove the chicken from the skewers and place on the chapatis. Top with yogurt and mango chutney, then sprinkle on the jalapeno slices and chopped red pepper. 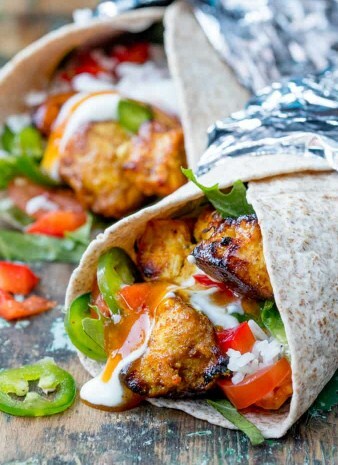 Roll the chapatis up and wrap in foil - burrito style - and serve immediately.